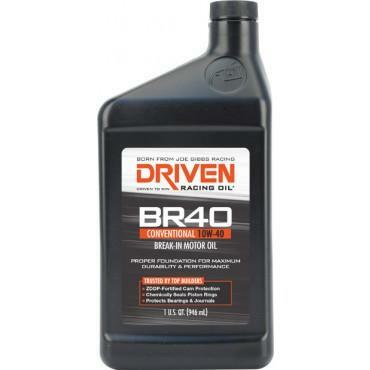 Driven Engine Builder Oil - Break-In Oil - BR40 SAE 10W-40 UNIVERSAL - Brakeswap.com - Friction for the Win! The same high Zinc and Phosphorus formula as our original break-in oil, now in SAE 10W-40 viscosity. Well suited for classic muscle car, European sports car and motorcycle engines. Ideal for flat tappet and aggressive roller valve trains. Does not require additional ZDDP additives. The same high Zinc and Phosphorus formula as our original break-in oil, now in SAE 10W-40 viscosity. Well suited for classic muscle car, European sports car and motorcycle engines. Ideal for flat tappet and aggressive roller valve trains, as well as Ethanol- blended, pure Methanol and oxygenated race fuels. Does not require additional ZDDP additives. Good for dyno testing, one night of racing or up to 400 miles on the str eet. Viscosity typical of 10W-40.